Q: Is there any other method for reducing leading time than by dividing orders up and creating smaller lots? A: The next method after breaking down into smaller lots is the dividing up of work. 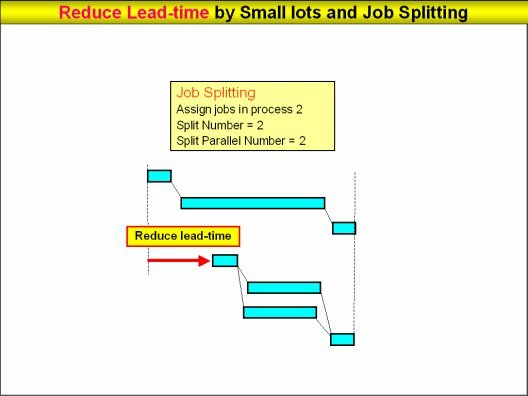 Lead-time can be reduced by dividing jobs up. The diagram below shows that the longer length of process #2 lengthens the entire lead-time of production. Process 2 is divided up into two parts and the work is conducted in parallel. In this case, lead-time is reduced by about 30 percent. However, such an action is premised on the use of multiple machines and equipment that can perform the same tasks. If there are three or more machines that can do the same job, dividing that work into N divisions allows lead-time to be cut even further.